One cannot help but feel refined while using a fountain pen. No, it’s not images of a preppy cashmere sweater tied around your shoulders as you pen your day’s busy schedule of tennis, luncheon & spa. Fountain pens actually create a physical, mental and ritualistic distinction. It feels special writing with a fountain pen whether it’s daily doodles or occasional epic poems. 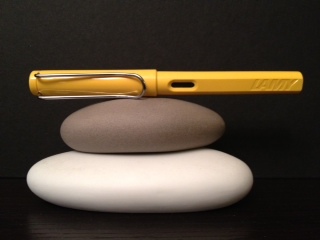 I kept it simple and affordable for my first fountain pen: LAMY’s Safari line in a bodacious yellow designed by Wolfgang Fabian. The German engineering’s modern, straight lines appeal to me more than the traditional tapered design. Safari is fresh and classic at the same time. Disclaimer: yes, fine (pun intended) pen nerds exist out there at international pen shows and on the Fountain Pen Geeks forum. I’m not at that level. I just like the bright yellow color, light plastic weight, and easy to use ink cartridge to pop in. Let’s start the most noticeable trait: the shiny metal nib, ending in a wide, medium, fine, extra fine, or left hand point. The delicate, yet strong steel nib forces the writer to slow down for fear of ripping through the paper. Fountain pen ink flows with almost no pressure that they’re arguably the world’s most “laid back pens!” The two flat sides for your index finger and thumb feels so comfortable that one wonders if carpal tunnel syndrome would exist if people used fountain pens instead of keyboards. I like how the ink pools a bit darker at the end of a letter by gravity. The slightly uneven gradient holds more personality for each word. The paper’s surface becomes extremely important to how the fountain glides, impresses, or slips off the paper. Using fountain pens on thick sketch paper is a delight! It’s also the revered approach in using the “ultimate writing equipment.” No, I do not use fountain pens for the mundane like domestic To Do Lists or furiously fast work notes. Office Depot’s industrial Pilot G ballpoint is relegated to that. 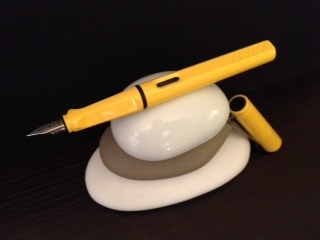 Since fountain pens will not be used for everyday writing, whatever I do use it for becomes even more special. Mysterious missives. Random doodles get elevated to Super Doodles. Who needs handmade cards or scrap booking when you can just write with a fountain pen? Rituals fall into two categories: intentional and unintentional. 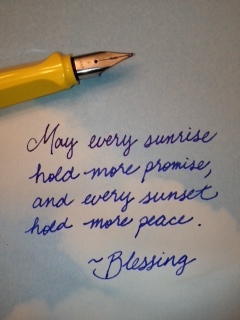 I have an unintentional practice of analyzing my handwriting in real time while using fountain pens. By slowing down and paying attention to that LAMY’s trail, I self-consciously wonder, “Geez, has my handwriting been that bad all this time?” It feels odd trying to change my personal typeface since one’s handwriting is usually hard coded. The intentional ritual is how I now prefer to write thank you notes with fountain pens; for that extra care. I don’t care if the recipient doesn’t know that their snail mail came to life by my fountain pen. I would know. Perhaps some people only journal with fountain pens. Would copy editors be less stressed if they used fountain pens instead of red markers? How would old school nerds be perceived if they carried fountain pens instead of mechanical pencils in their shirt pockets? Would these same nerds be hipsters who now wear black rimmed glasses without lenses? The application of these beautiful metal nib astounds and abounds! Limited Edition Mont Blanc, anyone? ← the only people for me!